These sunflower cupcakes are minty fresh and easy-as-can-be. What You Need: 1 cupcake; frosting (white or whatever you’d like); yellow mini mints (smooth and melty, the kind with white nonpareils on the flat side); chocolate sprinkles. How to Make It: Frost cupcake white. Add yellow mints, arranged in two circles but leaving a space in the center. Sprinkle chocolate jimmies in the center, guiding them with your hand or a funnel. 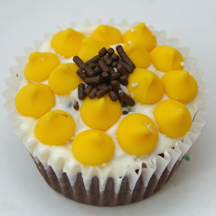 This entry was posted on Saturday, June 7th, 2008 at 3:41 pm	and is filed under flower cupcakes, summer cupcakes. You can follow any responses to this entry through the RSS 2.0 feed. Responses are currently closed, but you can trackback from your own site.